Note: Our Golden Treasury of Acting Scenes and all plays offered for sale are only available as digital downloads, from which you may print out your own scripts and accompanying production notes. The files are in Adobe Acrobat file format and are bookmarked for easy navigation. The digital files contain not only the script, but colored title pages, dividers, student handouts, and illustrations. They also include extensive notes on author, character summaries, sets, props, costumes, play adaptation, and any pertinent historical information useful for the teacher/director. An original classical music and/or sound effects score accompanies many of the plays, creating a complete package designed for optimal stage performance. Wherever possible, we have included in each product package beautiful copyright-free illustrations from famous artists to help the children visualize their characters and the costumes of the time. To order any product, please go to our order page. If you have any questions, or wish to purchase multiple items, please email us at familyplayhouse@rcn.com. For multiple purchases, we are happy to send you a combined shipping invoice. 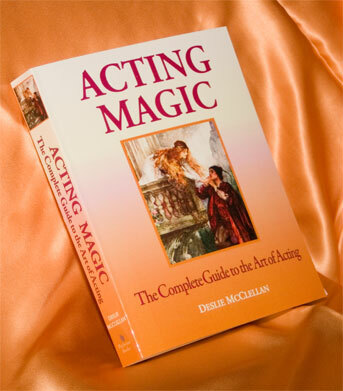 Acting Magic is a comprehensive 568-page guidebook that takes the aspiring actor from beginning voice, stage movement, and role-playing exercises to a high level of performance excellence and repertory discipline. Based on the author’s career as a professional actress and her many years of teaching drama to children and adults, the book breaks down all the components of acting into simple and engaging chunks so that even the youngest student can digest and successfully apply them on the stage. Games, stories, exercises, illustrations, handouts, and teacher’s keys guide the actor to discover everything the pros know. The extensive glossary and in-depth history of theater completes the book as a perfect study and performance text for acting companies and colleges alike. In addition to providing a firm foundation in the fundamentals of technique, Acting Magic also nurtures self-esteem, reinforces oral language skills, and inspires a real enthusiasm for classical literature. In a departure from modern Hollywood texts, the author shows the student how to re-capture the spiritual idealism and noble intention that artists of an earlier era conveyed with such grace, and which constituted the enduring magic of their artistry. The arts are meant to be an expression of the noblest and purest of human sentiments and a tribute to lives beautifully lived and fully given. As Russian director Constantin Stanislavski stated, art should lend beauty and nobility to life, and “whatever is beautiful and noble has the power to attract.” That is the true magic of theater, and Acting Magic powerfully expresses this message. Acting Magic will help you unlock the magic of theater and take you step by step through the heart of the dramatic experience. CLICK here to find out more details about this item. We offer for sale one large scene collection called The Golden Treasury of Acting Scenes. These are scenes for study, audition and recital programs, organized by age-group and seasonal or subject themes. Our collection has been carefully designed to lead a child through progressive levels of difficulty in acting skills. The scenes allow a child to express his emotions within safe and joyous parameters of life experience. They celebrate innocence and the overcoming of life's challenges by courage, faith, and the practice of personal honor. 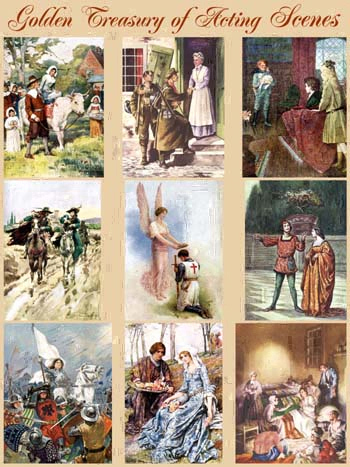 From the world of Aesop Fables to the old world charm of beloved classics like Little Women, Jane Eyre, The Secret Garden, and Anne of Green Gables, the children relive a time and place when virtue was the common goal of all educators, and honor the common aspiration of all young men and women. All our scenes have been edited and refined from repetitive performance and constitute a wonderful resource for homeschool drama programs, school enrichment and ministry courses. This is a fabulous and very special collection of our favorite acting scenes. The 426-page Treasury includes the best of our childrens classics, great literary classics, historical biography, patriotic, Christmas, Shakespearean, religious, traditional love and courtship, and contemporary scenes - all arranged according to age and performance difficulty. Most of these scenes are original adaptations that capture the purity and freshness of the author's intent without modern cultural overtones. Some of our most beautiful copyright-free illustrations from famous artists are included in this treasury.